The early history of Chinese furniture recorded in excavated material, engraved stone and stamped brick reveals a mat-level furniture culture. The ancient Chinese knelt or sat cross-legged upon woven mats surrounded by various furnishings including low tables, screens, and armrests. Examples of excavated lacquer furniture from the ancient kingdom of Chu (ca. 500 BC) demonstrate an aesthetic of minimalism and simplicity, and others are decorated with unique colorful patterns and bear finely carved decoration in relief and openwork. The blending of artistic form with practical functionality can be seen as a common thread running throughout the long history of Chinese furniture. Developments toward high seating were influenced by foreign customs and the migration of Buddhism. During the second century AD, the Han emperor Lingdi was recorded to have had a fascination with things foreign, including the foreign or "barbarian" seat (huchuang). This term referred to the folding stool, which at that time was commonly used by nomadic tribes in the more remote northern and western regions where it was also used for mounting horses. Being easily carried over the shoulder, it quickly became a popular seat for traveling or hunting. Low platforms were another early form of raised seating furniture which were used as honorific seats by high officials and religious dignitaries during ceremonial and sacrificial rites. Records from the Han dynasty (206 BC-220 AD) indicate that these sitting platforms were called ta; the relatively longer chuang was used both for sitting and reclining. With the eastward migration of Buddhism from India, chairs and raised platforms began to appear with more frequency as the status enhancing seats of great masters, along with the custom of disciples gathered around seated upon stools. Hourglass-shaped stools made of straw and basketwork also begin to appear during the Northern and Southern Dynasties (386-586 AD) period; similarly shaped stools of rattan are still found throughout modern China. During the transitional period--from mat to chair--kneeling and cross-legged positions upon the seating platforms was common. 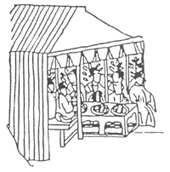 Additionally, the raised platform also began to function as a large, medium-height table for dining. 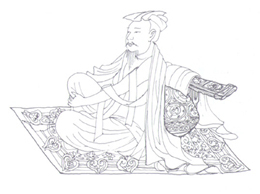 By the Tang dynasty (618-907 AD), stools and chairs had become common amongst the elite and those of rank. Prototypes to the yoke back chair as well as the round back chair appear in contemporary paintings and wall murals which depict the sitter with legs both pendant and crossed. By the Northern and Southern Song (960-1279) periods, many types of high furniture had developed and were commonly used throughout all circles of life. Scenes recorded within contemporary paintings as well as archeological finds reveal that tables, chairs, stools, and benches of the architecturally related recessed-leg style were widely used. Waisted cornerleg furniture is also evidenced in Song paintings, although, this more elegant form, with roots tracing back through Gandhara to early Greek architecture, appears to have been reserved for the elite and for activities of ritualistic and ceremonial significance. Many basic patterns established during the Song dynasties continued to mature throughout the Yuan and Ming periods into beautiful well-rounded and robust forms that were smoothly finished with thick lacquer coatings and finely detailed with painted decoration. During the late Ming and early Qing periods, furniture of a minimal classical style was abundantly produced in durable tropical hardwoods after a ban on imports was lifted in 1567. The use of these hard, dense woods spawned advancements in joinery techniques permitting the creation open, elegant forms previously unattainable in softer woods. This popularity of this furniture, which often reflected the restrained, elegant tastes of the scholar official's class, also spread through the rising nouveau-riche merchant class. After the fall of the corrupted Ming ruling house in 1644, China again flourished under the benevolent rule of the early Qing emperors. While early Qing furniture-makers generally held to classic patterns, a tendency towards refinement emerges correlating to that which permeated all of the decorative arts. Qianlong's fascination with antiquity stimilated archaistic decoration and styles in furniture design. Qing-style furniture is more angular in form, and the surfaces are often elaboratedly decorated. Unseperated from the culture and history, classical art gives us endless reverie, Chinese classical furniture, with the mark of the traditional Easstern civilization, conveys the information of our splendid history and the oriental concept of steadiness, solemness and glory. The chinese antique furniture styles of Ming and Qing dynasties are particularly unique for their elegance and delicacy. The Ming style antique chinese furniture has been considerd as the model of Chinese furniture, with its craftsmanship exquisite, its looks elegantly simple, the lines simplified and smooth, the mortise and tenon firm and the construction resonable, Craftsmen of the Qing dynasty inherited the charm of the Ming style, added a lot into it and created a new style. Modern society witnesses the growing temptation of truth and nature. Ming furniture is characterized by a simple and elegant structure with fluent lines and appealing proportions. Qing furniture in contrast is larger and more imposing with elaborate carving and inlaid decoration. These two types of furniture differed greatly in style but each reached a high level of artistic success and can claim a place in the history of world furniture. Chinese furniture was highly developed in the Ming Dynasty. Carpentry skills had already reached a high level in the Song and Yuan dynasties. This combined with the growing prosperity of city commercial economy, the rise of house and garden buildings and the import of large quantities of hardwood from Southeast Asia facilitated its success. 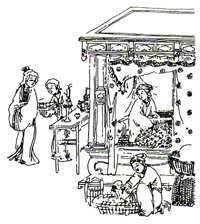 From extant Ming furniture can be seen that Ming furniture covered all varieties of Chinese furniture. Its shapes, simple lines, pleasing proportions and a tight mortise and tenon structure formed a distinct artistic style. Great emphasis was placed on the use of the natural beauty of the wood grain together with adopting latticework and openwork carving. This simple classical style has helped to establish its fame. The chinese antique furnifure of the Ming and Qing dynasties is of exquisite design, unique workmanship and coreful carving. It has been the rare treasure and one of the most splendid parts of Oriental culture.